Our primary aim is the preservation and protection of the unique ecosystem that is the Ragati Conservancy – but in a way that is inclusive and sustainable. 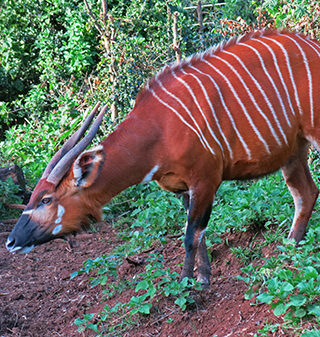 There are estimated to be only 150-200 mountain bongo left in the wild and they are endemic to Mt. Kenya, the Aberdares and the Mau forest (where there are only thought to be 4-6 individuals left!). Many of these are within the Conservancy. We will be working with various experts on the opportunity for re-introducing bongo and other species who used to call this home. We aim to build a research station to the East of the Conservancy and are looking for partnerships and funding to help us understand the whole ecosystem and build systems to ensure it will be flourishing 50 years from now and for future generations to enjoy. Mammals found in the Ragati include; Leopard, Mountain Bongo, Giant Forest Hog, African Elephant, Buffalo, African Clawless Otter, Spotted Hyena, Sykes and Colobus Monkeys, Bushbuck, Waterbuck and the Black-fronted Duiker. Other notable taxa include the Mt Kenya Mole-Shrew, Mt Kenya Mole-rat, Mt Kenya Thicket Rat and East African Tree Hyrax. Notable reptiles are the Mt Kenya Bush Viper and Montane Viper and Mt Kenya Soft-horned Chameleon. There are 880 plant species of which 11 are endemic and 150 are near-endemic in the Kenya Forest Reserve and National Park. 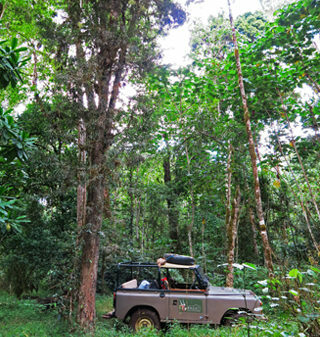 The Afro-Montane zone consists of tall yellow wood forests, bamboo thickets and rosewood woodland. The Afro-alpine zone consists of ericaceous and an alpine belt with a high number of endemic plants. The Montane forest and alpine zone is also very rich in bird fauna with over 200 bird species and 53 of Kenya’s 67 African Highlands biome species. The following have been recorded in the area; Crowned Eagle, Ayres’s Hawk Eagle, African Long-eared Owl, Forest Guinea Fowl, Black and White Casqued Hornbill, Hartlaub’s Turaco and Tacazze Sunbird. We can supply a full checklist on request. These are of special interest to us because they are endemic to Mt Kenya, the Aberdares, the Mau forest and are extremely rare. Poaching has reduced their population to as few as 100-150 individuals in the wild and we know that some of these inhabit the upper reaches of the Ragati; in the bamboo zone at an altitude of 2,800m to 3,200m. With land pressures and the other side effects of an ever-growing human population conservation must work hand in hand with the local community to limit human-wildlife conflict. Ragati is partnering with the local community to provide job opportunities on the Conservancy, education programmes to help them understand the economic benefits of the Conservancy as well as a revenue stream for the Kenya Forestry Service (KFS) and Kenya Wildlife Service (KWS). Our first large project will be to establish a trout farm. We will train and staff the farm from the local community and it will supply fingerlings to the Ragati and tributaries and also sell trout commercially to help fund our conservation activities in the Conservancy.